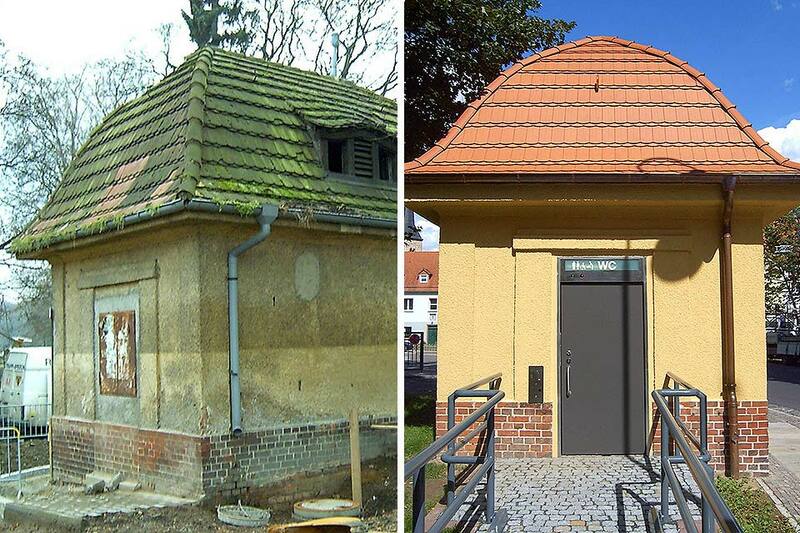 Renovation of sanitary facilities: Transforming old into new. As a municipal partner, we have built more than 6,000 public toilet facilities during the past 40 years. In addition to free-standing toilet facilities for towns and cities, we also redevelop and renovate toilet facilities in public buildings, shopping centres, schools, car parks and train stations. Our experience allows us to provide our customers with toilet facilities that ideally combine customer requirements, aesthetics, functionality and long-life cycles. Constant attention is directed toward ensuring the highest level of value, hygiene and design. Alongside the renovation of facilities we also provide built -in public facility options. The Flexi-Kit toilet facilities are prefabricated, inserted through an opening in the building, and are operational within 24 hours. Picture gallery "Renovation of toilet facilities"